Our website has readers from all over the world. and now our readers can share their stories with other insurance agents and maybe provide a helpfull tip. What is a Q. R. code and how can it help you promote your insurance business? Take a second and see how this valuable tool works. Increase your visibility. - Let others know about you. We are going to allow our readers, meaning you, to freely promote themselves, their agency, their top producer or just share a great idea. Our website has over 100,000 page views per month. 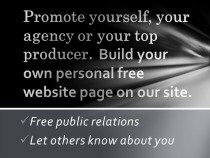 Compliments of our website, you can now build your own free personalized public relations page on our website. Once completed, You will be sent the link so you can pass it on to others. It's simple and easy to do. If you are a recruiter, list your area, name and phone number to be contacted. Enter Your Information: (Start by entering your name, your agency, your top producer or your sales tip.) You must include your e-mail address or we can not publish. This will be your personal page. You can promote this page to your agents, your clients, etc and add to it at any time. You must include your e-mail address or we can not publish.